Kukke Subramanya temple is an important Hindu temple dedicated to Lord Subramanya son of Lord Shiva and Parvati. It is located in Subramanya village of Sullia Taluk in Dakshina Kannada district of Karnataka, India. It is a most important temple for Hindus and the locals of Karnataka. As the temple is located in Western Ghats one can get a perfect view of Kumara Paravatha from behind the temple. The temple is on the western slopes of the Ghats which is covered with dense evergreen forests. This holy temple is situated on the bans of river Dhara. This river originates in Kumara Parvatha Mountain and further move towards western sea. Temple has very interesting history. It is believed that Lord Subramanya visited this place along with his brother Lord Ganesha and other aides after defeating asura and their chief named as Tharakasura and Soorapadhma. Later Lord Subramnaya cleansed his axe in the river which later came to be known as Kumara dhara. All Gods appreciated the work of lord Subramanya and Lord Indra requested Subramanya to marry his daughter Devasena and accept her as his wife. The auspicious marriage took place in the presence of Gods like Brahma, Vishnu and Maheshwara (Shiva) at Kumara Paravatha. Another mythological story is that Vasuki who is an ardent follower of Lord Shiva was a serpent king. He was meditating in the Biladwara cave of Subramanya to stop the attack from Garuda (eagle). From the instructions of Lord Shiva, Lord Subramanya allowed Vasuki to reside in this place for ever hence any prayers offered to Vasuki is considered as prayer offered to Lord Subramanya. Do visit this holy temple and get the blessings of Lord Subramanya. The temple faces towards the east and the main entrance is at the back of the sanctum. Between the sanctum and the entrance lies the Garuda stamba (pillar) which is silver plated. It is believed that the pillar protects the pilgrims from the poisonous breath of Vasuki who is still residing in the caves of subramanya. Every year during the month of Karthika Bhahula dwadashi to margashira shudha Poornima lakshadeepa festival is celelbrated here. Thousands of people visit every year to take the blessing of Lord Subramanya. Some of the important celebrations performed during this period are the Chandramandalotsava, Ashwavaganosava and Mayura Vahanastava. Shasti is an important day for Lord Subramanya on this day Sri Subramanya Swamy and Uma Maheshwara visit the place in the morning to celebrate the festival. 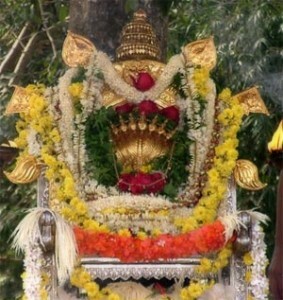 It is believed that Garuda who doesn’t appear in this place during the whole year makes its presence on the Ratharohana and again at the time of Avabrath Mahastava. The temple is known for the removal of Kaalasarpadhosha of people by performing Ashlesha Bali. The is an important seva or pooja performed to remove the kaalasarpadosha and kuja dosha of people. Thousands of people perform this pooja every month on the day of Ashlesha nakshaktra. Pooja is performed at 7am and at 9:15 am and after the completion of the pooja and Homa devotees can take prasada from the temple. This is performed to remove Kaalasarpadosha, Santhana dosha and other related problems. This pooja is performed on all days except on Ekadashi (fasting day for Hindus). This is performed by devotees to get rid of the bad effects of sarpa (snake). It is believed that this dosha comes from the curse or bad done to snakes from the present or the previous life. People performing this seva should stay in the temple for 3days. After taking blessing from the Lord one can plan to visit many places which are near to Kukke Subramanya. Some of the places are Sakleshpura which is a beautiful hill station which is at a distance of around 60 km from Kukke Subramanya. Another Hill Station is Coorg which is at a distance of 75 Km from Kukke Subrmanya. Belur which is a beautiful Historical place is at a distance of 95 km. Belur is famous for Chennakeshava temple. Hoysaleshwara temple which is in Halebidu at a distance of 110 km is also a must visit place in Karnataka, India. Another holy temple of Lord Subramanya is Ghati Subramanya. 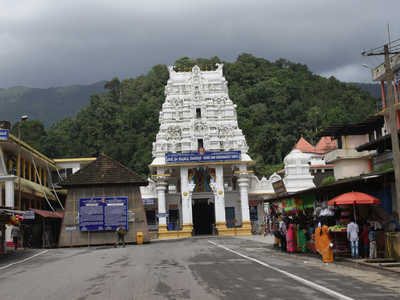 Tourists can also plan to visit this temple after Kukke Subramanya temple to take the blessing of Lord Subramanya. The distance between Kukke Subramanya and Ghati Subramanya is around 300 Km which is around 6hr drive. Or tourists can take a break in Bangalore and proceed next day to Ghati Subramanya. Ghati Subramanya is located at Doddaballapur near Bangalore, Karnataka, India. It is 60 km from Bangalore and one can visit the temple in the morning and come back to Bangalore by evening. 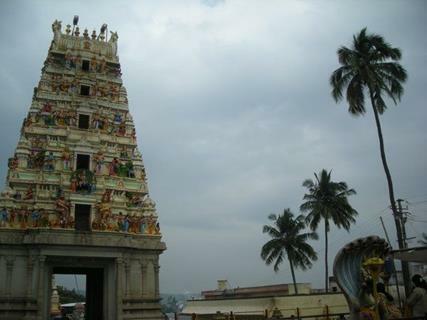 Ghati Subramanya is a temple dedicated to Lord Karthikeya or Subramanya and lord Lakshmi Narasimha. It is believed that both the idols are self originated from earth (udhbhava in Kannada). The temple is open from morning 6am to 8:30 pm in the evening. Both Ghati subramanya temple and Kukke subramanya temple are quiet similar in performing all the sevas and the deity in the both the temples in Lord Subramanya. Here in Ghati Subramanya Lord Subramanya is in the form of a snake. It is believed that the temple is around 600years old and belongs to Dravidian period and also the temple is constructed in Dravidian style. It is believed that the temple was first constructed during the Sandur dynasty period by Gorpade rulers. It is understood that God appeared in the dreams of the King and revealed the details of the idols. Then the king along with the help of locals found the idols and developed a temple which is now known as Ghati Subramanya. It is a very important pilgrimage place in the South India. Thousands of people visit the temple and offer their prayers to Lord Subramanya and Lord Narasimha. Idols of snake are erected by the devotees are developed on a single stone all round the temple. The temple is built in Dravidian style of architecture. The entrance of the temple has a huge Gopuram which is beautified with sculptures of various Hindu deities and from Hindu mythology. The temple is dedicated to lord Subramanya and Lord Lakshmi Narasimha. 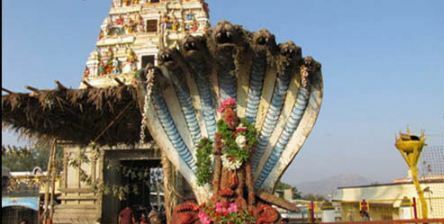 The uniqueness of this temple is that Lord Subramanya is in the serpentine form faces east and Lord Lakshmi Narasimha faces west. To make tourists see both the idols there is a huge mirror placed behind to see Lord Lakshmi Narasimha. Some of the important facts about the temple is that there are many idols of snake outside the garbha griha and the pradakshina path. One can offer milk to these idols of snake on regular basis. It is the firm belief in the visitors that the childless couple would be able to conceive on visiting this temple and offering prayers to Lord Subramanya. Some of the important rituals that are performed here are Kuja Dosha, Sarpa Dosha, Naga Prathista and Nivarana Puja. 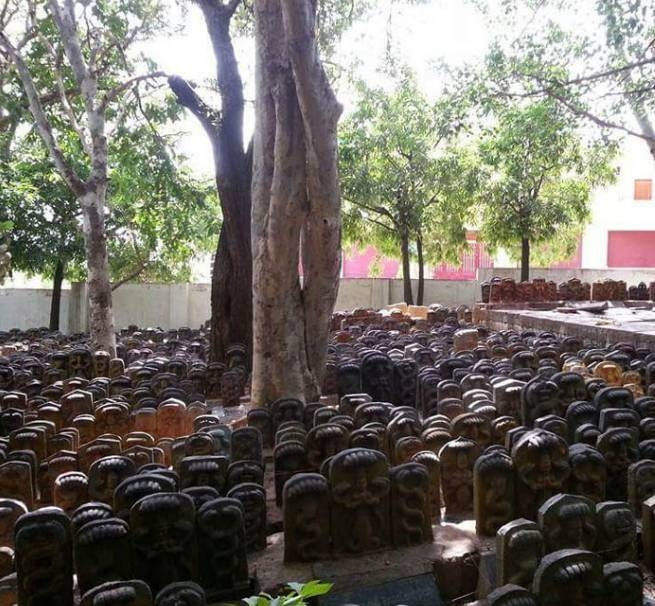 The major and important rituals in this temple are the installation of snake idols all around the temple. The snake idols are made of stone and tourists can see thousands of such idols all around the temple being erected. Tourists can also visit near by places after having Darshan of Lord Subramanya and Lord Lakshmi Narasimha at Ghati. Some of the nearby places are the famous Nandi Hill station which is located at a distance of around 25 Km from Ghati Subramanya. Another temple which one can plan to visit is Devarayanadurga. The temple is dedicated to lord Narsimha. It is around 50 km from Ghati Subramanya. Situated at a distance of around 100 km Bannerghata National park can be your another important destination to visit. One can also rest in Bangalore for some time and later visit the park. It is a very beautiful park where tourists can see wild animals like tiger, lion, bear, elephants and many more. It is a very good place to spend good quality time. The nearest airport to Ghati Subramanya is Bangalore airport which is at a distance of around 60 Km. One can book a cab or take a bus from Bangalore to Ghati Subramanya. The nearest railway station is Bangalore railway station. By road there are plenty of government and private buses to Ghati Subramanya. One can also book a cab and drive down to Ghati Subramanya. Get blessed and enjoy the place.